Ichiro will be a 2018 Seattle Mariner (Pending Physical):.....He turns 45 on October 22, making him the oldest position player in MLB since Julio Franco (Braves - 2007 - age 49). What would really top it off is if he somehow managed to cobble together at least four triples this year too! Last edited by Seattle1; 03-15-2018, 02:26 PM. His 3,000th hit was a Triple so that's not entirely out of the question. Ichiro hit 3 home runs last year, with a home park that's difficult to homer in (unless you're Giancarlo "Muscles" Stanton) so hopefully, even with limited playing time he'll get his 100th as a Marine this year. 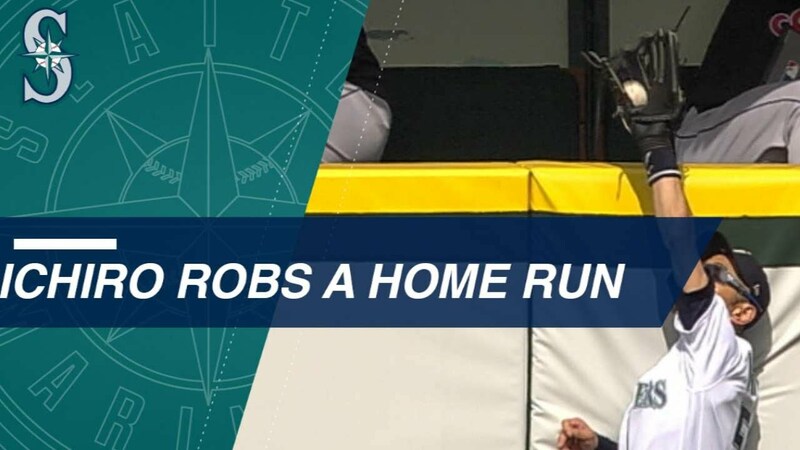 "Ichiro Suzuki leaps at the wall in left field to rob Jose Ramirez of a home run." Ichiro may play in a two regular season game series in Tokyo to kick off the 2019 season. The short series in front of Japanese fans would make a nice way for him to end his playing career. Otherwise he is done and his final hit total is 3,089 with 509 stolen bases and 2,514 singles. His retirement took me by surprise and I would have liked to see him get to 3,100 hits at the very least. He played what might be his final MLB game on May 2, 2018. Wow, it really is a graceful ending of his career. Nothing beats playing the last games in his home country. I remember feeling the same when he left with 99 homers. 99 is a good number but a 100? Perfection. Some of the Mariners, including Ichiro are already in Tokyo and 'Ichiro Mania' has swept japan. I now hear that Ichiro has been promised that he will play in those two games of March 20 and 21, jut I think that will be the end of the line for his MLB career. At least he is getting to retire in front of Japanese fans and he gets to put on the uniform of his beloved Seattle Mariners two more times. He has already stated publicly that he will never return to the Japanese leagues as a player...….so this really looks like the end of his playing career. Despite the fact that Ichiro came to spring training in fantastic shape and the fact that he has the lowest percentage of body fat of any player in the Mariners Spring Training camp, that just didn't translate into playing ability, particularly into hitting skills and Ichiro was overpowered this Spring by pitchers that he would have 'lit up' just a few years ago. It's like the NHL where a Detroit Red Wing by the name of Darren Helm got his 100th career goal (a modest career total) just two nights ago on March 14. "It took me more than 615 games, but I finally got there. ', Helm has been quoted as saying. (To be exact Helm's 100th goal came in his 618th NHL game, all of which have been with the Red Wings). Last edited by philliesfiend55; 03-16-2019, 12:44 PM.